The local attraction of the 32nd annual K-Town Tri brought out many IronStriders and familiar faces from all around for a chance to compete. The long course had athletes swim 2 km in rolling Lake Ontario, bike 56.2 km out to Gananoque and back, and run 15km out through Lake Ontario Park and back. Ryan had a 3:22:43 finish, 24th overall, and an exciting 2nd place in his age group. Lianne started out with a solid overall swim time, and continued her speed as she passed a number of competitors on the bike. During her run she did well to finish 5th in the womens category, and hold 1st in her age group with a time of 3:23:36. 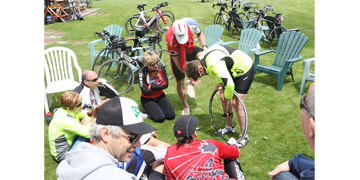 A relay of the long course brought a team from Focus Personal Fitness Studio and Health in Focus -Massage Therapy in Kingston together as well. Trainer Ben took to the swim surprised by it’s difficulty but made it through. He setup Chelsea to go fast on her new triathlon bike from T.I. Cycle, and fast she went! Trainer Megan ran the large 15 km run well for a team finish of 3:56:36. Also moving and shaking was Joan with some great speed. She had an awesome swim, biked the 30 km in under an hour, and finished off leading her AG for 1st in 2:09:46! Also moving and shaking was Joan with some great speed. She had an awesome swim, biked the 30 km in under an hour, and finished off leading her AG for 1st in 2:09:46! Great event, good job everybody!